Corrects wrinkles and dull complexion, providing a more youthful look. 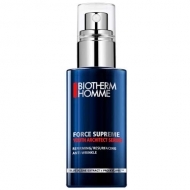 Force Supreme Youth Architect Cream from Biotherm is a anti aging cream suitable for men over 40 years, operating in the visible signs of aging. This product is a multiConcealer cream enriched with Algae of Youth extract. Easily corrects wrinkles, lack of firmness, dull complexion, uneven tone and lack of hydration. Apply A.M. and/or P.M. to a clean, dry skin. Ideal for after shaving.